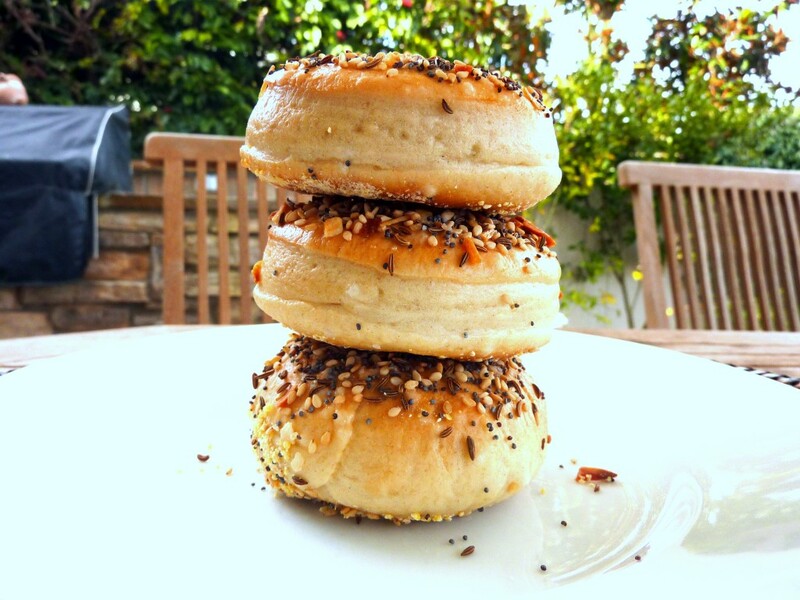 Ever tried homemade Everything Bagels? If not, you’re in for treat. After trying this simple recipe, you’ll never want to go back to store-bought! Happy New Years everyone! I know it’s been forever since I posted and I’m so sorry! My best friend Sarah from Canada has been here and I’ve barely had time to bake, nonetheless take pictures and post! It’s been craziness. But last night around 10 P.M. I decided I wanted to make bagels for some odd reason. Boy, am I glad I did. They’re so good, but we’ll talk about that in a bit. First, we’re going to talk about 2011. 2011?! This is the year I graduate high school. No way can this year already be here. No waaay am I starting college this year. Freaks me out a bit, but I’m so excited. It’s so weird, because 7th grade feels like it was about a week ago. Does anyone else feel like that?? Time just seems to move faster the older I get. It’s weird. Not sure how I feel about it. Can’t I just go back to sitting on the floor of my purple-painted room playing with Barbies and not having a care in the world? Those were the good-ole days. I didn’t even wear clothes. I was so free. If I didn’t wear clothes now…oh goodness. Can’t even imagine what would happen, but I don’t think it would be received well. And if I still played with dolls? I think my parents would be concerned. Getting older has so many responsibilities and so much to learn, but that’s life, right? In food though, I LOVE growing. It’s exciting to learn to do new things and perfect the things that once made you want to stick needles in your eyes. So here we have it: the list of my foodie goals to accomplish in 2011. Make croissants, homemade all the way. Get a canner and learn how to preserve all the delicious seasonal fruits. 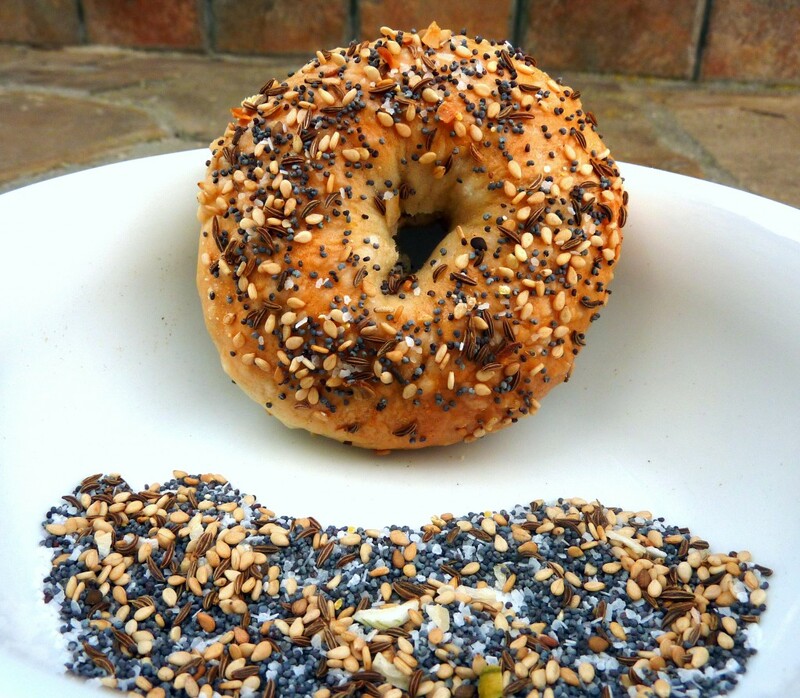 Make healthy bagels – I’m talkin’ flax, whole wheat, the whole shebang. Make more healthy treats and make them taste good! Try out a few gluten/vegan recipes. Bug the grandparent’s to find me some old family recipes. Try making my Great Grandma Nelly’s Meringue Cake. Perfect Great Grandma Nelly’s Chocolate Fudge Frosting recipe. Get myself a good, professional camera! Figure out a way to get over my annoyance of making ice cream. Make my own crystallized ginger. Make more meals in addition to my desserts. So for now, those are my goals. I’m sure more will make it on to the list as the year goes on, but I think that’s a good starting point, right? And one of my goals has already been crossed off. 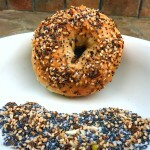 I didn’t write it up there, but I’ve been wanting to make bagels for an awfully long time. They just seem like one of those foods that aren’t worth the effort because they taste just as good from the local bagel shop, right? WRONG. 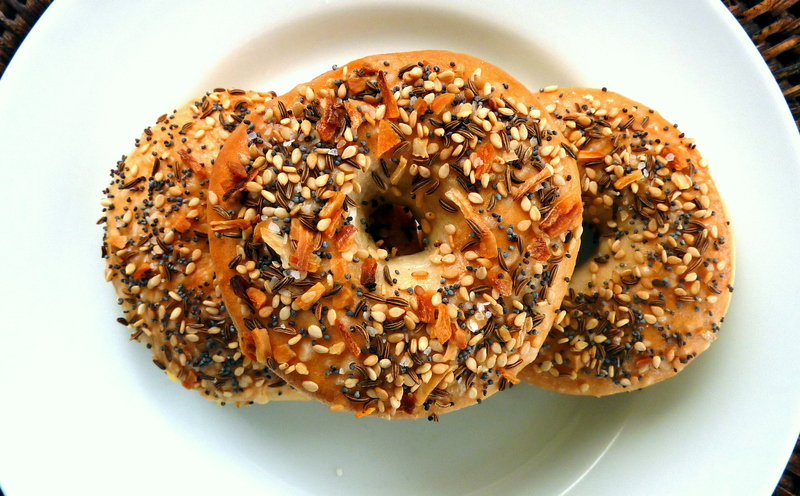 These bagels were so much better than anticipated. They were also deceivingly simple to make. I even made a few mistakes in mixing the dough and boiling the water and they still turned out amazing. They had an amazingly dense crumb with a perfectly chewy crust that just tears off when you take a bite. It’s truly what a bagel experience should be. They were so so good. Even better, you can totally experiment with flavors. I just made everything bagels but you can bet that within the next week I’ll have some chocolate chip or cinnamon raisin bagels on my kitchen counter (and in my tummy). So start crossing off from your list! Confront that fear of yeast and let’s start making bagels! Place water, sugar and yeast in the bowl of a mixer and let sit until foamy, about 5 minutes. Mix together flour and salt and slowly add to the yeast mixture until completely combined. Using the dough hook or by hand, knead for about 2 minutes until the dough is smooth. When dough is smooth, let it rest in a warm place for about thirty minutes. While dough is resting, boil the 3 quarts of water. Once water has reached a boil, add the three tablespoons of sugar. Cut dough into 10 equal pieces (for smaller bagels) or 6 equal pieces (for larger bagels), and roll each piece into a small ball. Flatten balls slightly. Poke a hole in the middle of each with your thumb. Twirl the dough on your finger or thumb to enlarge the hole, and to even out the dough around the hole. Cover bagels with a clean cloth, and let rest for at least 1 hour. While dough is resting, boil the 3 quarts of water. Once water has reached a boil, add the three tablespoons of sugar. Preheat oven to 375 degrees F. Sprinkle an ungreased baking sheet with cornmeal. Mix together all the seeds and the salt. Carefully transfer bagels to boiling water. Boil for 1 minute, turning half way through. Drain briefly on clean towel. Arrange boiled bagels on baking sheet. Glaze tops with egg white, and sprinkle with the seed mixture. Bake for 20 to 25 minutes, until well browned. Enjoy! Cinnamon Raisin: Add 1 tablespoon of cinnamon and 3/4 cup of raisins to the dough when adding in the flour. Eliminate the seed mixture. Asiago: Add 1/2 cup of Asiago cheese to the dough when you're adding the flour and top with additional cheese right before baking. Leave out the seed topping. Chocolate Chip: Add in 1 cup of miniature chocolate chips to the dough with the flour. Leave off the seed mixture. If you can make these totally beautiful bagels on your own, you can definitely handle croissants!! I’m super impressed. I’m just getting into working with yeast doughs. I’ve been using some of the great things from the King Arthur flour website. My first attempt at bagels was with a recipe from there and it was so-so. 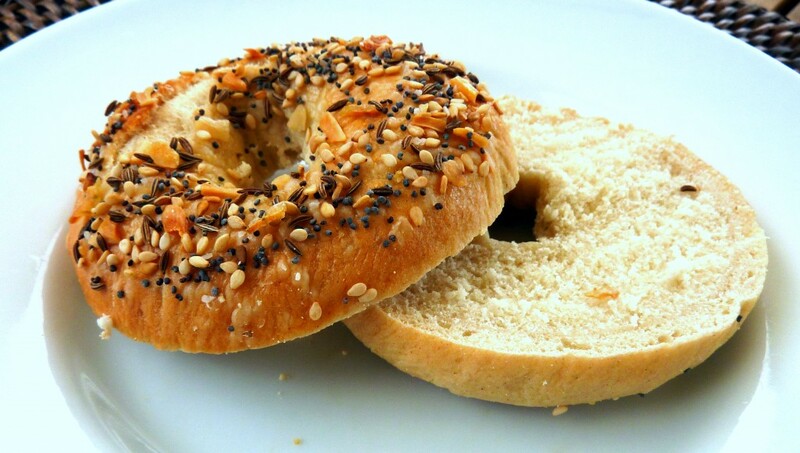 I saw these on foodgawker and they were actually what FIRST attempted me to try my hand at bagels. I don’t know why I didn’t use this recipe because it is easy and PERFECT. The bagels were really amazing and my husband has informed me he expects them regularly. Great job and thanks for sharing! Wouldn’t you know it, I was searchng around for everythign bagel recipes and yours came up! I had been meaning to come by and say hello, and how it was nice to meet you last saturday but I’ve been so swamped since then. But now I have no excuse since I’m using your recipe. I was looking for a bagels recipes as my little girls love them. I think I’m broken because I cannot seem to bring myself to purchase baked goods at stores. Thanks for posting this. They look delicious and I can’t wait to make them this week. Enjoy college and believe everything your parents ever told you about guys!!! Congratulations and all the best!